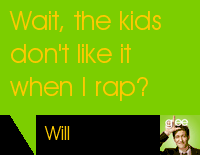 Season 2 quotes are on the Glee Quote Generator – get yours now! Back in June, I unveiled the Glee Quote Generator – the best way for you to show off your love for all things Glee on your own sites and blogs. Now that season 2 has finally arrived, I’ll be adding new quotes to the database after each week’s episode, so if you don’t yet have the Glee Quote Generator on your site, what are you waiting for? Episode 1’s amazing quotes are already in the database, as you can see from the pic to your left! Just copy and paste the code right into your blog, and you’re good to go! Super-duper huge thanks go out to Mo Jangda for building and designing the quote generator, and to Jen Dibble for helping me add in all of the quotes! ← Two preview vids from “Britney/Brittany”: See John Stamos and hear Brittany sing! Do the people who actually watch this drivel even realize that ALL THE SONGS they hear are not written by anybody on the show, but are, in fact, cover songs by other artists?? And why would anybody buy a second-rate karaoke version of a great song instead of the real thing??????? You’re missing the point. Ever heard of satire?